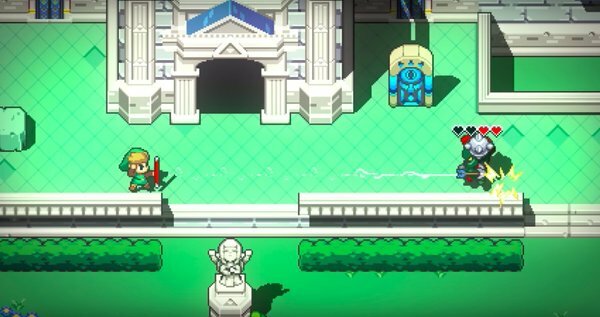 Cadence of Hyrule is a mash-up that no one saw coming. It was a complete surprise in so many ways, most of which was the game being a collab between Nintendo and an indie studio. It's uncharted territory for the Big N, but definitely shows that the company is embracing some new ideas as far as IP utilization. One big-name dev who was just as surprised to see this game announced was none other than Yuji Naka. Mr. Naka said that some time ago, he proposed an idea to Nintendo that would have him working with Mario in some way. Nintendo was quick to shoot down the proposal, and that was that. Seeing as how Nintendo is allowing an indie dev to work with the Zelda license goes to prove that the Nintendo of old, at least in some ways, is no longer a thing. I think it’s fair that they are the ones who decide on the evolution of their mainline series. Well use your new Square Enix contracts to try again! Yeah, Nintendo allows an indie dev to work with the Zelda license, but only for a spin-off game. They would never let an indie dev to work on a Zelda adventure game, or a Mario platformer. That’s the reason why they also accepted the collab with Ubisoft on Mario+Rabbids. They even told Ubisoft that they didn’t want Mario to be able to jump. That’s for a reason. Maybe they should. Super Mario Flashback shows more respect for the series and Mario as a character than what Nintendo is doing with 2D Mario now. I however would settle for a Fast RMX 2: Featuring F-Zero or an indie-led Paper Mario. No kidding. Could you imagine what would it be like if Ubisoft were to make the next Super Mario/Zelda main game? I mean, technically, one could think Shin’en could make the next F-Zero. And my point is that it won’t happen. The scope a modern mainline Zelda project have reached, even excluding BotW, isn&apos;t exactly something an indie studio can make in a reasonable amount of time. This doesnt explain thier relationship with Capcom (Zelda Oracle of Seasons/Ages & Minish Cap) tho. ubisoft isnt even indie either. I&apos;m glad Nintendo is loaning their characters out for more fun crossovers, I&apos;d love to see Samus in more things. Lot of games she&apos;d fit into super well. Enter the Gungeon has tons of Metroid love in it, just saying. Other characters we don&apos;t see as much in their own games would be great (Star Fox in that other space shooter is a perfect example). It&apos;s fun to see Mario and Link getting out and doing stuff but we see Mario and Link every year. We see Samus MAYBE once every five, and even less for characters of legacy franchises like F-Zero. Unfortunately Nintendo doesn’t even acknowledge Metroid anniversaries. I get the feeling that most collaborations will continue to involve only Mario or Zelda. Let Playtonic make the next DK game Nintendo since Retro is stuck on Metroid Prime again. Not to mention if Playtonic made the next DK game we&apos;re pretty much guarantee to get K.Rool and the Kremlings back as antagonists. You say that like Retro doesn’t want to work on Metroid. It&apos;s the hottest may may that Retro is an abused housewife who is being thrown down staircases and being forced (FORCED, I say!) to make universally beloved games that have made them one of the most revered devs today. I definitely didnt mean it like that. I know Retro showed Nintendo a demo of their Prime 4 after whoever was developing before messed up. Yes I&apos;m excited to play Retro&apos;s Prime 4. But as a bigger DK fan than Metroid fan it would&apos;ve been nice to see a 3rd and final entry in Retro&apos;s DKC series. Looks like I may be waiting another 5+ years before I get another DK game...*sigh* its funny how Nintendo&apos;s 5th best selling franchise gets treated like it sells on the same level as Metroid, F-Zero, Fire Emblem (yet this series seems to get a new game every 2 years or so) or Star Fox or something. Nintendo has changed so much in the last five or six years. They are letting third party partners use their IP in small ways like Zelda items in Skyrim or something bigger like Cadence of Hyrule. It isn&apos;t new but it is happening more frequently. Also, the change is even more apparent now with their partnership with Microsoft. We are still seeing that unfold, too. I honestly doubt that Microsoft and Nintendo are tagging along. There has to be some background motivation as to why Microsoft is fine with porting their owned IPs to their competitors systems and it is hinting that Microsoft might go to the SEGA route if their next gen console or project scorpio doesn&apos;t do as expected. They failed to make Xbox the device in everyone’s home, so I think they’re shooting to make Xbox the service on everyone’s device. Honestly, aside from being the first console developer to push online in a big way, I never felt Microsoft had a whole lot to offer. I don&apos;t think you&apos;re gonna see a Nintendo game on a Microsoft console, but I think Nintendo is gonna have some big stuff to announce with Microsoft in an upcoming Nintendo Direct or E3. This is at least going to be xCloud on Switch and maybe some more Xbox/PC exclusives like Cuphead coming to Switch. Also, probably a lot more crossplay games, too. There were also rumors of other IP coming to Switch like Halo and Gears of War. All of this is just speculation based on a bunch of rumors about Nintendo/Microsoft. The Cuphead thing ended up being real so it makes me think they might be closer than they have ever been. The wishful thinking part of me wants to believe that someone at Microsoft figured out that Switch might be a viable platform for IP that might not find much success on a Microsoft console. Believe what you want. There&apos;s a catch to all of this I tell ya.